If you are considering a new build, renovation or an extension, The Big Green Home Show is the place to start. We're returning to London for the RIBA CPD Roadshow, where we will be presenting 'Innovative Brick Match Solutions at 10.45am. 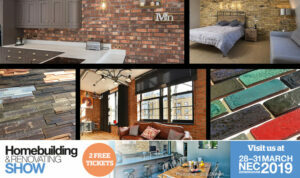 London Build is the leading construction show to cover London and the South of England. Join us at the RIBA Roadshow in York where our UK Specification Manager will be delivering the CPD 'Innovative Brick Match Solutions' at 10.45am. Visit us at The Historic Buildings Parks and Gardens Event on Tuesday 13th November 2018 at the Queen Elizabeth II Conference Centre, London. RIBA members can register to attend a full day of CPD in Cambridge, where we will be presenting our 'Revolutionising Restoration' seminar. We're returning to the Jewson Live event on Thursday 13th November, where you can discover new innovative products, view live product demonstrations and receive practical advice. RIBA members are invited to register for the free Oxford roadshow, where Imperial Bricks will be presenting the CPD seminar 'Revolutionising Restoration' at 10.45am. Architects and specifiers can register for the London RIBA Roadshow, where our Architectural Specification Manager will be delivering our 'Innovative Brick Match Solutions' CPD seminar.